Guppies (Poecilia reticulata) are wee freshwater fish that are frequently kept as pets in aquarium settings. These diminutive family Poeciliidae creatures are originally from Venezuela, Trinidad and Tobago, Brazil, Guyana and Barbados. Guppies are found all over the planet, not only as pets but also for management of populations of mosquitoes. Guppies indeed are tiny fish, and usually grow to anywhere between 2 and 2.5 inches in length. The sexes of these diverse and intensely colorful fish are usually not difficult to tell apart, as the females tend to have shorter tails with more elaborate designs. The males are usually significantly smaller than the females, as well. Male guppies attain physical maturity when they're two months old, while the females take roughly a month longer. Out in nature, guppies exist in many types of settings, including canals, ditches, streams and ponds. Guppies are in no way choosy about the foods they consume. If you offer guppies something, they'll probably eat it. However, it is crucially important to be careful about what you allow these little guys to eat. Tropical fish flakes and fish foods formulated specifically for guppies both make suitable components to guppy diets. They also enjoy munching on plants -- think water sprite and hornwort. 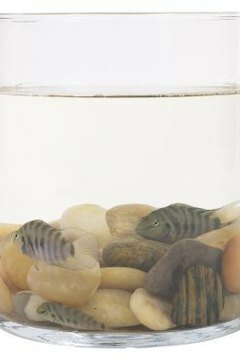 Other additional items that work well for guppies are tubifex worms, zucchini, algae, brine shrimp and bloodworms. Talk to an aquatic veterinarian if you have any questions or concerns regarding feeding guppies healthy and balanced diets. As omnivores, guppies in the wild take in a combination of animal and plant-based meals. They are especially fond of crustaceans and small bugs -- the latter being one of the primary reasons that guppies are associated so strongly with mosquito pest management. Bug larvae, detritus, zooplankton and benthic algae are all also typical elements in the wild guppy menu plan. Guppies in aquariums flourish when allowed to eat several times each day. Tiny pinches of food between two and three times daily generally are effective for these little ones. Never give guppies more food than they can take in within a span of a few short minutes. Since these tiny fish require lots of feedings, it also is important that their water is refreshed a lot as well. With so much food going in, it is easy for their water to get dirty -- not good.